In a Reddit AMA, technology visionary Bill Gates lost a lot of fans when he gave his opinion on Bitcoin, honing in on a pretty weak argument for its use. It’s “used for buying fentanyl and other drugs, so it is a rare technology that has caused deaths in a fairly direct way,” Gates expressed. But, Bill, drugs have been around for much longer than Bitcoin has, and people have been buying them for centuries, so how ever did they manage before this digital currency came along? Blaming a tool for its unintended use is quite foolish. Yes, drugs can be bought with Bitcoin, as can life-saving medical procedures. You see, this digital currency is just that, a currency, like US Dollars, Nigerian Naira, Thai Baht and Russian Ruble, all which are equally adept at buying drugs. 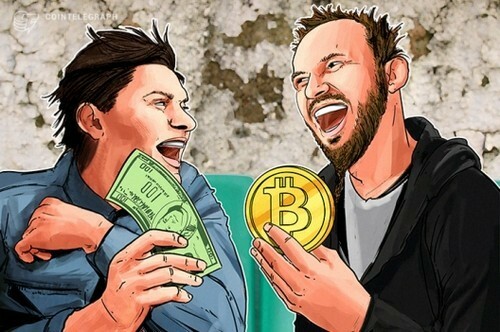 There was a time where because of circumstances, Bitcoin was used often for buying of illegal substances, from drugs to guns and even hitmen. This all resulted from dark web marketplaces such as the infamous Silk Road. Bitcoin was the currency choice on the Dark web, as it had many attributes that suited this shady underworld. It was decentralized, anonymous and digital. Bitcoin was thus the only way people could buy these illegal substances – on this marketplace. Bitcoin was still quite unknown, and a very small fish in terms of its market cap and in comparison to any other currency, asset or market. But during this period, its primary use was probably for illegal activities. But, as Bitcoin has organically grown and been adopted into more mainstream markets, the use of the digital currency as a Darknet staple has been declining. There is empirical evidence that Bitcoin, itself, is falling out of favor as a currency on the darknet, but statistically, mainstream adoption means less “criminals” are holding and spending Bitcoin. In a recent paper published in January this year at the University of Sydney Business School, some numbers were quantified when it comes to Bitcoin buying and illegal activities. Looking at these numbers, currently, there are almost 28.5 mln Bitcoin wallets that hold more than 0.001 BTC according to data compiled by Bitinfocharts.com. However, most Bitcoin users have several wallets and use multiple wallet addresses to increase their financial privacy when transacting. Hence, the number of users is likely less than that number. But to counter that, there will be a lot of inactive wallets, and a number of other factors that shift this number around. Therefore, it really comes down to an estimate, and hence, around 20 mln Bitcoin users globally can be considered as a fair estimate. So, the numbers stand at five million users of Bitcoin have bought illegal goods with it. And 10 million illegal transactions happen annually. Additionally, just over half of the Bitcoin in circulation has been used for illegal activities. These are big numbers, but when it comes to comparisons to other payment options, it starts to shine a light on just how small the Bitcoin drug trade is. What about guns and murder? Part of the fear that whirls around Bitcoin is that it was not only used for buying drugs but, especially when it came to the Silk Road, it was apparently a tool for purchasing weapons as well as hitmen. However, the truth of the matter is that while guns could be purchased on the Silk Road, and with Bitcoin, they account for a very small portion of sales. Nicolas Christin, assistant research professor of electrical and computer engineering at Carnegie Mellon University, is one of the researchers behind a recent deep-dive analysis of sales on 35 marketplaces from 2013 to early 2015. Drugs are far more common. 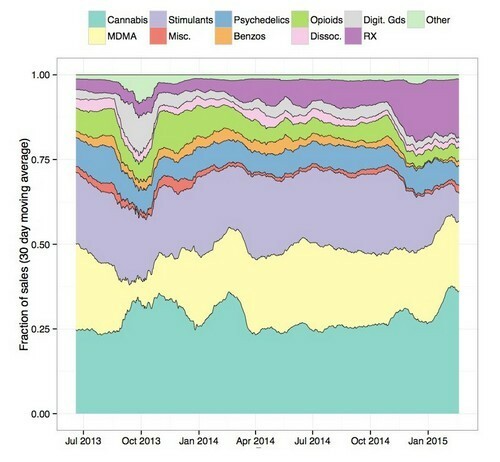 Specifically, MDMA and marijuana each account for about 25 percent of sales on the dark web, according to Christin’s research. But weapons are so uncommon that they were lumped into the “miscellaneous” category, along with drug paraphernalia, electronics, tobacco, Viagra, and steroids. Together those account for maybe three percent of sales. In comparison, albeit legal, gun purchases in the US alone account for a huge number of data with regards to background checks shows. The figures show that there were 16,808,538 applications for gun licenses in 2012. If they were approved, that would be enough weapons to stock a member of NATO’s armed forces nearly five times over. To straightaway put this into context, the report from Sydney reads that half of Bitcoin has at some stage been used for illegal purchases. Then, a report conducted just on US Dollars, and relating just to cocaine, says that 90 percent of bills hold traces of the white powder. In the same paper, which outlined the numbers for Bitcoin drug buying, another report is cited from the US White House Office of National Drug Control Policy that estimates the drug users in the United States, in 2010, spent around $100 bln annually on illicit drugs. So in contrast, the initial report outlines that annually: “36 mln transactions, with a value of around $72 Billion” occur with Bitcoin, meaning that 44 percent of $72 bln – $31.6 bln – is spent annually, globally, on drugs. Yet, in the US alone, in 2010, $100 bln was spent on drugs. The vast majority of drug users still purchase illicit substances via more ‘traditional’ methods. According to a 2017 Global Drug Survey, regardless of country, less than half of drug users purchase substances via the dark web in any one country. The global median for a percentage of drug users who use the darknet is 10.1 percent. The fact of the matter is Bitcoin is used for illegal activities and substances, but there should be no special guilt attached to it. It is a tool of the internet, and with online purchases, across all sectors, growing, it is unsurprising that this currency that only exists online comes into play. Online payments are constantly growing as more and more people turn away from cash, with Sweden, the leader in becoming a cashless society. These online payments give the opportunity to people to buy goods and services online. But, because credit and debit card purchases online for drugs and illegal goods are not possible, or certainly not smart, people look for other opportunities. The ease and convenience of buying online extends to the illegal markets, and just because there is a tool to do it with, doesn’t mean that the tool is the enemy. Drugs are the enemy, and while they continue to exist, so will means to purchase them. Still, though, cash is king when it comes to drug purchasing, yet, there are no calls to ban the USD despite $100 bln worth contributing to the drug epidemic.